In this article, I will show you how RESTx – an open source project for the creation of RESTful web services and RESTful resources – allows front-end developers to quickly and easily make their own data resources, without having to rely on the back-end server team for every new requirement. All is well until you realize that every time you need a new data resource you have to discuss this with the back-end team. Your request may go on their todo list and if you are lucky it becomes available to you with the next iteration. In the meantime, you lose time, need to muck about with fake testing data and see your deliverable jeopardized by the inability of the back-end team to deliver in a timely manner if they feel for some reason that other things are more important. “Well”, you might say, “we have very general query interfaces to all of our data, so I can specify the query I need by sending it to the server in the URI or the message body”. There are problems with this approach, however: For one, that query you are talking about may contain query parameters that are not intended for public viewing. Those queries can leak anything from access credentials to databases, to hints about the internal structure of your data, which you’d rather keep private. They are now showing up in your client code and – possibly worse – in server, proxy and firewall logs at every stage between the client and the back end. You may also break caching schemes along the way, thus making your system less scalable. Furthermore, you are now closely coupling client side code with particular server-side implementation details, which means that a simple change on the server side now may result in changes all over your client code. Besides, sending full-blown queries in the URI or message body (using POST or PUT to get query results?) is not particularly RESTful, is it? As you can guess by now, I think have a solution for you: RESTx. RESTx is a new open source project, which – amongst other things – addresses just this scenario. You will be able to create your own RESTful resources just by filling out a simple form. I will explain that in a moment with an example, but let me just give you a little background for RESTx first. Your back-end development team also might find this interesting. RESTx is completely stand alone, and very easy to install and setup. On the server side there are components. A component implements the necessary logic to produce the data of a RESTful resource for you. The data of that resource may be the result of a complex calculation, of a specific data integration logic – which is particularly easy to implement – or it may just encapsulate access to a custom database or legacy API. Those components can be written in Java or Python, with more languages to follow soon. The component API is very straight forward. So, your back-end development team certainly can chose the language that it is most comfortable with or that is most appropriate for the task and it can get up to speed very quickly. Now, a piece of software on its own usually cannot do much. It also needs to have some parameters and configuration. That’s exactly where you come into play. You see, with RESTx providing these parameters for the code is not something that takes place somewhere hidden in config files in the background. It’s also not something you need to produce laboriously (and wrought with all the disadvantages discussed earlier) with every single request. Instead, you as the “user” of the server can very quickly and easily specify the particular configurations you want for a back-end component. In fact, you only need to fill in a single form. The server remembers the parameters you have provided and returns you a new URI, something small and simple, without parameters dangling off at the end. Fill out this form and you just created yourself a RESTful resource. The URI of the resource in a way is a handle to the particular configuration you specified, but that doesn’t have to matter to you or anyone else who uses this resource. You can create as many of those RESTful resources for any component as you like. There it is! The current weather conditions in San Francisco, hidden behind a simple, easy to use URI. 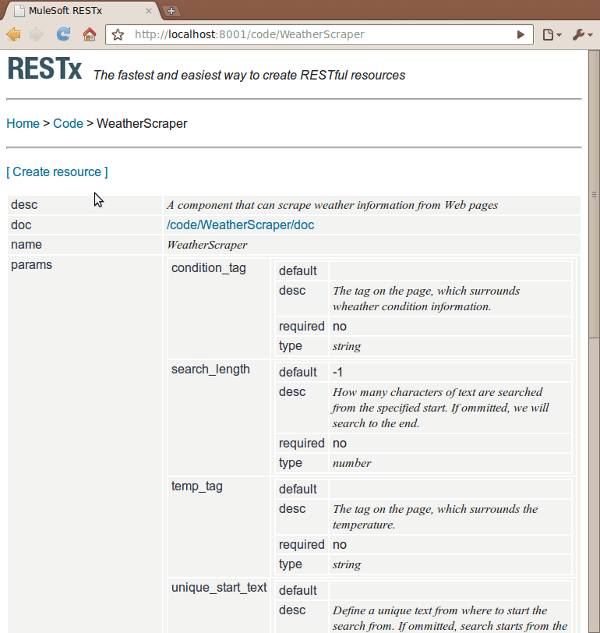 When you hit that URI, RESTx retrieves the stored parameters you provided when you created this resource. 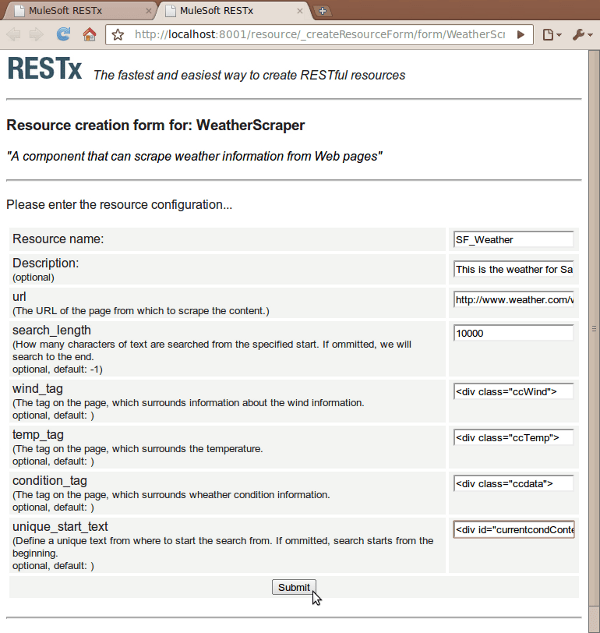 It then invokes the WeatherScraper component and applies those parameters, resulting in the server retrieving a page from weather.com, extracting the weather data and returning the result. But none of that is of any importance to the user of this URI. In fact, let’s say your back-end team finally gets around to implement your request. 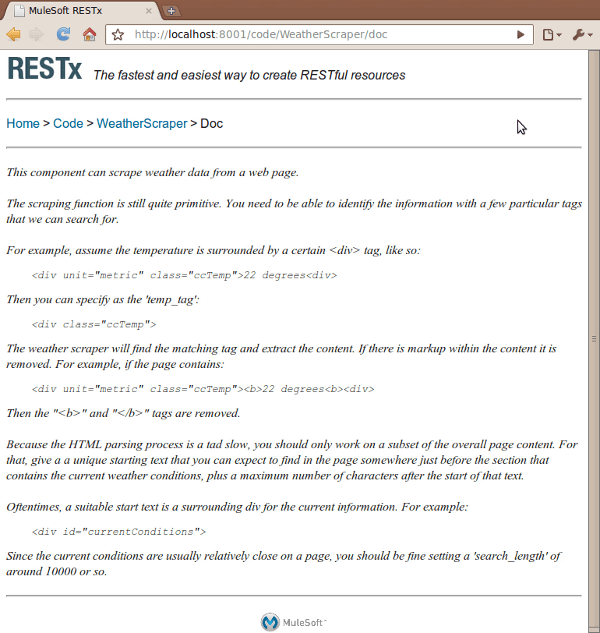 They write a RESTx component to access the actual API from weather.com or any other weather service. 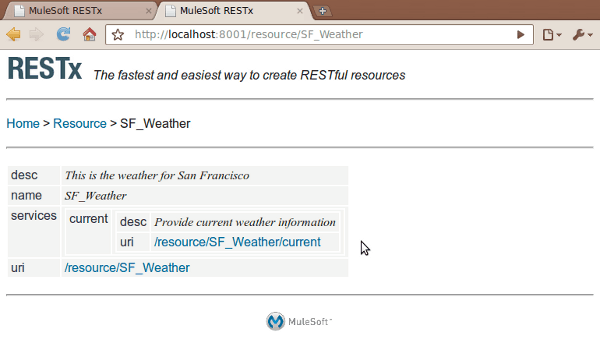 Now provide a proper set of parameters to that component to retrieve the weather information for San Francisco. Specify the same name for this new resource and it will be created with the same URI: “/resource/SF_Weather”. Now all your client applications continue to work as if nothing happened. That is the advantage of encapsulating more complex data access scenarios and queries behind their own dedicated URIs. "Wind": "Wind: From SW at 15mph"
Screen scraping is of course not the only application here. You can imagine components that provide access to databases, special APIs and all sorts of data sources. RESTx’s RESTful resources are not just read-only. If implemented in the component, you can also update and create entities via PUT / POST. We believe that RESTx is the fastest way to create RESTful resources in your organization or in the cloud. It gives you as front-end developer a greater degree of freedom, allows you to use safer URIs and generally improves the speed and agility of your team: Let the back-end developers focus on programming access mechanism for data, while you as the front-end developer or user can focus on exactly which data you want. If you want to give RESTx a try, you can download it here. There is also a quick start guide you might find interesting. How to you migrate from the ‘own datasource’ to the real stuff later? the funny thing about this,is that while it’s a great implementation, it’s driven by old-stereotypes that you can’t work with data people. teams dont’ stop at the FrontEnd code. @Alex: You can migrate an entire RESTx server to a new location (new URI path, for example) with a single setting. Basically, change a prefix and restart the server. Integration code and resources continue to work. Alternatively, you can take all the created resources from your development server and merely copy them to the data store of the production server. They will instantly become available, even without server restart. I agree that teams don’t always stop at the front-end code. However, you do have to admit that you often have teams with different specializations and skills. Imagine you accumulate a number of interesting components over time, which encapsulate access to your organization’s data assets. Developing a new application, mashup, client interface, etc. could be driven by the front-end team alone, since they can create (many of) the required data resources themselves. They have the resource done and available to them in less time than it would take to explain the requirement in an email to the back-end team.